If there's one thing we know, its technology. The team at Tengio have always been gung-ho in adopting new technologies; it’s integral to our core business. We make it our business to understand your business and the unique challenges involved, so we always start our process by learning all about you; who uses your service or product, how you work, your ethos and personality. After learning as much as possible, our team will brainstorm ideas, iterating on your feedback and work to find a tech solution that works for you, be it an easy-to-use mobile app or a high-end virtual reality simulation. The next step is to create a shared understanding of the product. This involves close collaboration with you to understand your brand, its core values and design philosophy. Our team of in-house designers take these values, the product definition and create a visualisation of the product in the form of wireframes or prototypes. After the design stage, your project will be assigned members of the Tengio team with specialisation in the technology your project requires to bring it from the drawing board to life. We make it our priority to build you a product that is robust, maintainable and long lasting Our development process is based around continuous delivery with short feedback loops. You receive regular and transparent updates and we adapt our process to your feedback. Your success is our success. We believe in products that are built to last the test of time. We also believe that the best relationships are the ones that last the longest. We don’t leave you all alone once the app has been built. We can help you take your product to market and grow and maintain it over time as new content is needed, or to keep up with advances in technology. We believe in a relationship that is flexible and focuses on your priorities as a business. We are based at the Somerset House, London. We work with businesses worldwide and we work at the cutting edge. Making technology deliver. Creating stunning customer solutions. It’s what gets us out of bed in the morning. It’s why we love coming to work. It’s what we’re good at. 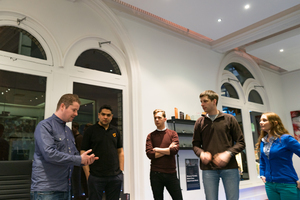 We’ve brought together a team of dedicated, passionate individuals who love building great products. From native mobile and web applications to Virtual Reality and AI, we’ve got our finger on the pulse. Our customers – such as Groupon, Gumtree or Adzuna – trust us to deliver outstanding results. Every time. We wouldn’t settle for less. We love technology but we think personality is pretty important too. Tengio's first VR game has been featured on the Google Daydream store. 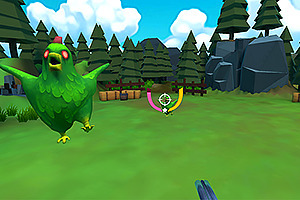 Oz Chicken Slayer is a fast-paced shooter built for the Google Daydream system. The game has a bold and humorous tone harking back to the ridiculous shooting games and action movies of the 90s. On the 9th of February, we found ourselves in Manchester, arriving just in time for a light flurry of snow welcoming us to "The North". We were visiting for the VR Arts Launch Event, a sort of mini-expo on VR largely focused on its potential narrative applications, so filled with filmmakers and performers alongside the usual tech fans common at VR events.